This is a hands-on tutorial on deep learning. 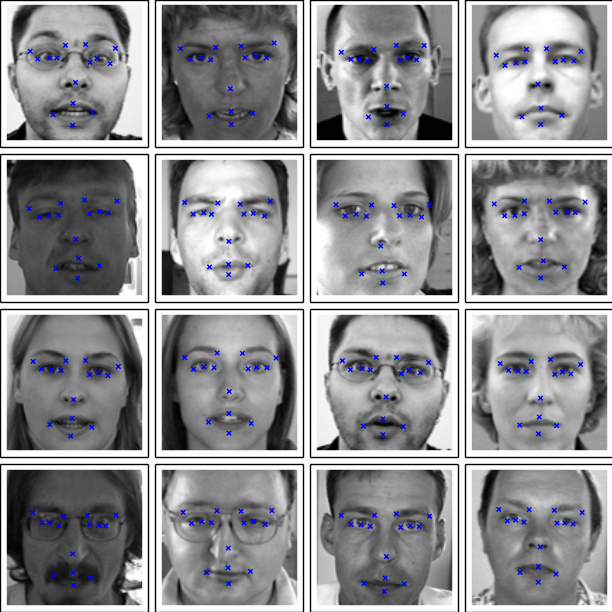 Step by step, we'll go about building a solution for the Facial Keypoint Detection Kaggle challenge. The tutorial introduces Lasagne, a new library for building neural networks with Python and Theano. We'll use Lasagne to implement a couple of network architectures, talk about data augmentation, dropout, the importance of momentum, and pre-training. Some of these methods will help us improve our results quite a bit. I'll assume that you already know a fair bit about neural nets. That's because we won't talk about much of the background of how neural nets work; there's a few of good books and videos for that, like the Neural Networks and Deep Learning online book. Alec Radford's talk Deep Learning with Python's Theano library is a great quick introduction. Make sure you also check out Andrej Karpathy's mind-blowing ConvNetJS Browser Demos. You don't need to type the code and execute it yourself if you just want to follow along. But here's the installation instructions for those who have access to a CUDA-capable GPU and want to run the experiments themselves. If everything worked well, you should be able to find the src/lasagne/examples/ directory in your virtualenv and run the MNIST example. This is sort of the "Hello, world" of neural nets. There's ten classes, one for each digit between 0 and 9, and the input is grayscale images of handwritten digits of size 28x28. This command will start printing out stuff after thirty seconds or so. The reason it takes a while is that Lasagne uses Theano to do the heavy lifting; Theano in turn is a "optimizing GPU-meta-programming code generating array oriented optimizing math compiler in Python," and it will generate C code that needs to be compiled before training can happen. Luckily, we have to pay the price for this overhead only on the first run. If you let training run long enough, you'll notice that after about 75 epochs, it'll have reached a test accuracy of around 98%. 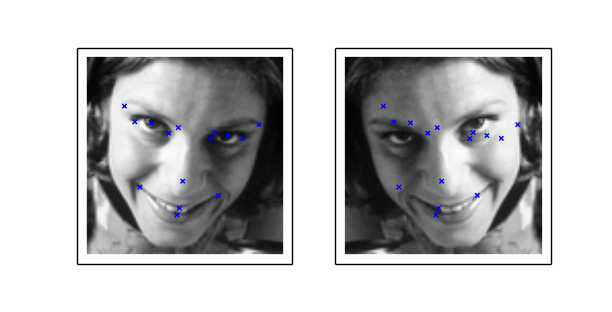 The training dataset for the Facial Keypoint Detection challenge consists of 7,049 96x96 gray-scale images. For each image, we're supposed learn to find the correct position (the x and y coordinates) of 15 keypoints, such as left_eye_center, right_eye_outer_corner, mouth_center_bottom_lip, and so on. 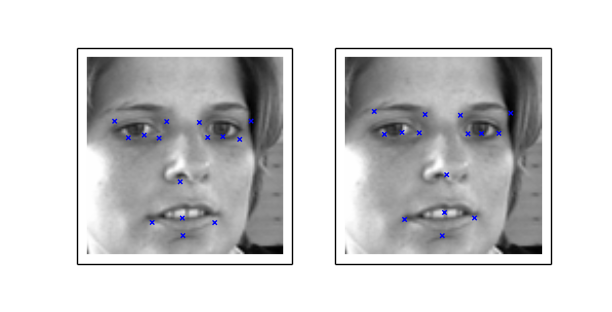 An example of one of the faces with three keypoints marked. An interesting twist with the dataset is that for some of the keypoints we only have about 2,000 labels, while other keypoints have more than 7,000 labels available for training. """Loads data from FTEST if *test* is True, otherwise from FTRAIN. First it's printing a list of all columns in the CSV file along with the number of available values for each. So while we have an Image for all rows in the training data, we only have 2,267 values for mouth_right_corner_x and so on. The script's output y.shape == (2140, 30) tells us that there's only 2,140 images in the dataset that have all 30 target values present. Initially, we'll train with these 2,140 samples only. Which leaves us with many more input dimensions (9,216) than samples; an indicator that overfitting might become a problem. Let's see. Of course it's a bad idea to throw away 70% of the training data just like that, and we'll talk about this later on. Another feature of the load() function is that it scales the intensity values of the image pixels to be in the interval [0, 1], instead of 0 to 255. The target values (x and y coordinates) are scaled to [-1, 1]; before they were between 0 to 95. We set the first dimension of input_shape to None. This translates to a variable batch size. We set the output_nonlinearity to None explicitly. Thus, the output units' activations become just a linear combination of the activations in the hidden layer. 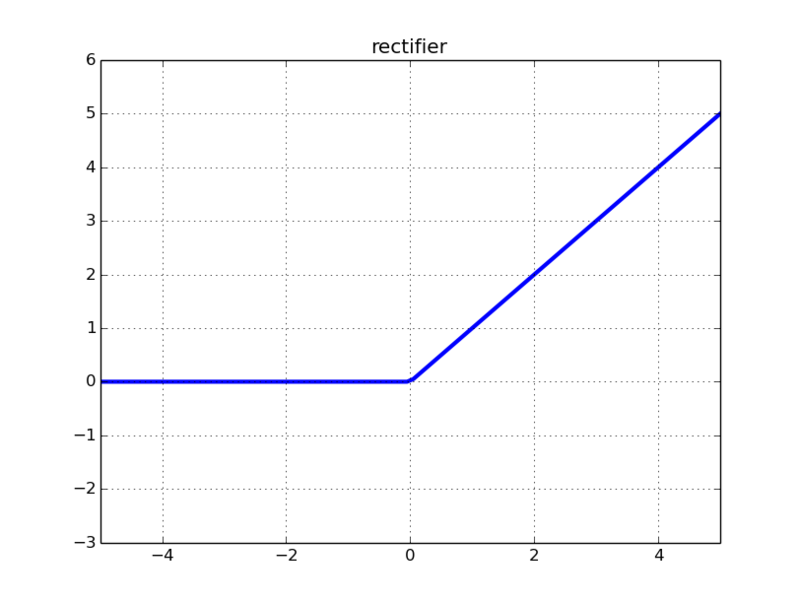 The default nonlinearity used by DenseLayer is the rectifier, which is simply max(0, x). It's the most popular choice of activation function these days. By not explicitly setting hidden_nonlinearity, we're choosing the rectifier as the activiation function of our hidden layer. The neural net's weights are initialized from a uniform distribution with a cleverly chosen interval. That is, Lasagne figures out this interval for us, using "Glorot-style" initialization. There's a few more parameters. All parameters starting with update parametrize the update function, or optimization method. The update function will update the weights of our network after each batch. We'll use the nesterov_momentum gradient descent optimization method to do the job. There's a number of other methods that Lasagne implements, such as adagrad and rmsprop. We choose nesterov_momentum because it has proven to work very well for a large number of problems. The update_learning_rate defines how large we want the steps of the gradient descent updates to be. We'll talk a bit more about the learning_rate and momentum parameters later on. For now, it's enough to just use these "sane defaults." Comparison of a few optimization methods (animation by Alec Radford). The star denotes the global minimum on the error surface. Notice that stochastic gradient descent (SGD) without momentum is the slowest method to converge in this example. 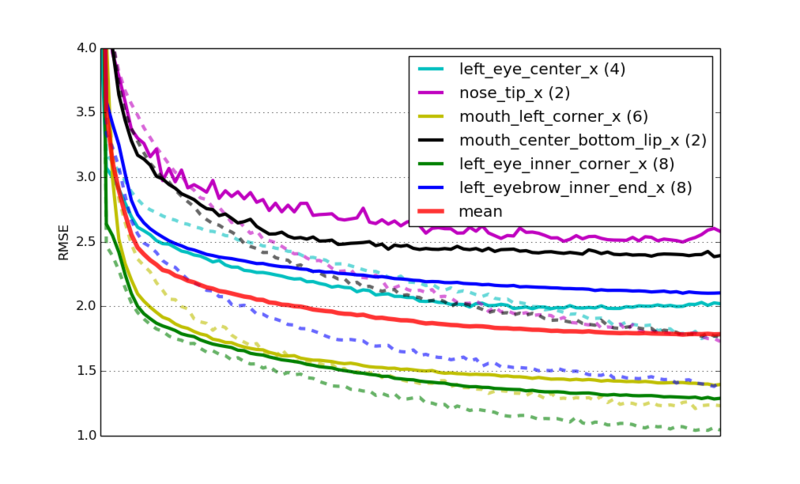 We're using Nesterov's Accelerated Gradient Descent (NAG) throughout this tutorial. In our definition of NeuralNet we didn't specify an objective function to minimize. There's again a default for that; for regression problems it's the mean squared error (MSE). We can see that our net overfits, but it's not that bad. In particular, we don't see a point where the validation error gets worse again, thus it doesn't appear that early stopping, a technique that's commonly used to avoid overfitting, would be very useful at this point. Notice that we didn't use any regularization whatsoever, apart from choosing a small number of neurons in the hidden layer, a setting that will keep overfitting somewhat in control. Our first model's predictions on 16 samples taken from the test set. The predictions look reasonable, but sometimes they are quite a bit off. Let's try and do a bit better. pooling: static subsampling of inputs. Units in a convolutional layer actually connect to a 2-d patch of neurons in the previous layer, a prior that lets them exploit the 2-d structure in the input. When using convolutional layers in Lasagne, we have to prepare the input data such that each sample is no longer a flat vector of 9,216 pixel intensities, but a three-dimensional matrix with shape (c, 0, 1), where c is the number of channels (colors), and 0 and 1 correspond to the x and y dimensions of the input image. In our case, the concrete shape will be (1, 96, 96), because we're dealing with a single (gray) color channel only. We'll build a convolutional neural net with three convolutional layers and two fully connected layers. Each conv layer is followed by a 2x2 max-pooling layer. Starting with 32 filters, we double the number of filters with every conv layer. The densely connected hidden layers both have 500 units. There's again no regularization in the form of weight decay or dropout. It turns out that using very small convolutional filters, such as our 3x3 and 2x2 filters, is again a pretty good regularizer by itself. 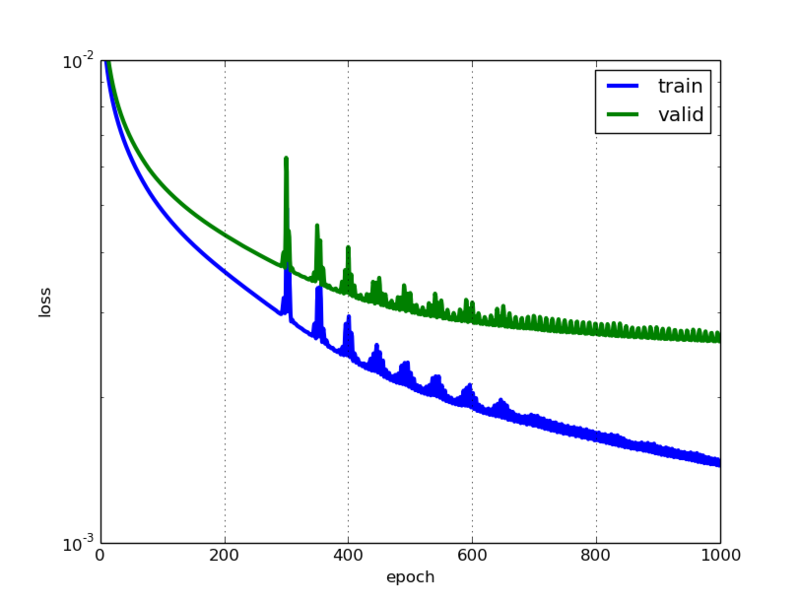 Training this neural net is much more computationally costly than the first one we trained. It takes around 15x as long to train; those 1000 epochs take more than 20 minutes on even a powerful GPU. The predictions of net1 on the left compared to the predictions of net2. This looks pretty good, I like the smoothness of the new error curves. But we do notice that towards the end, the validation error of net2 flattens out much more quickly than the training error. I bet we could improve that by using more training examples. What if we flipped the input images horizontically; would we be able to improve training by doubling the amount of training data this way? Data augmentation lets us artificially increase the number of training examples by applying transformations, adding noise etc. That's obviously more economic than having to go out and collect more examples by hand. Augmentation is a very useful tool to have in your deep learning toolbox. We mentioned batch iterators already briefly. It is the batch iterator's job to take a matrix of samples, and split it up in batches, in our case of size 128. While it does the splitting, the batch iterator can also apply transformations to the data on the fly. So to produce those horizontal flips, we don't actually have to double the amount of training data in the input matrix. Rather, we will just perform the horizontal flips with 50% chance while we're iterating over the data. This is convenient, and for some problems it allows us to produce an infinite number of examples, without blowing up the memory usage. Also, transformations to the input images can be done while the GPU is busy processing a previous batch, so they come at virtually no cost. Left shows the original image, right is the flipped image. Now we're passing our FlipBatchIterator, but we've also tripled the number of epochs to train. While each one of our training epochs will still look at the same number of examples as before (after all, we haven't changed the size of X), it turns out that training nevertheless takes quite a bit longer when we use our transforming FlipBatchIterator. This is because what the network learns generalizes better this time, and it's arguably harder to learn things that generalize than to overfit. 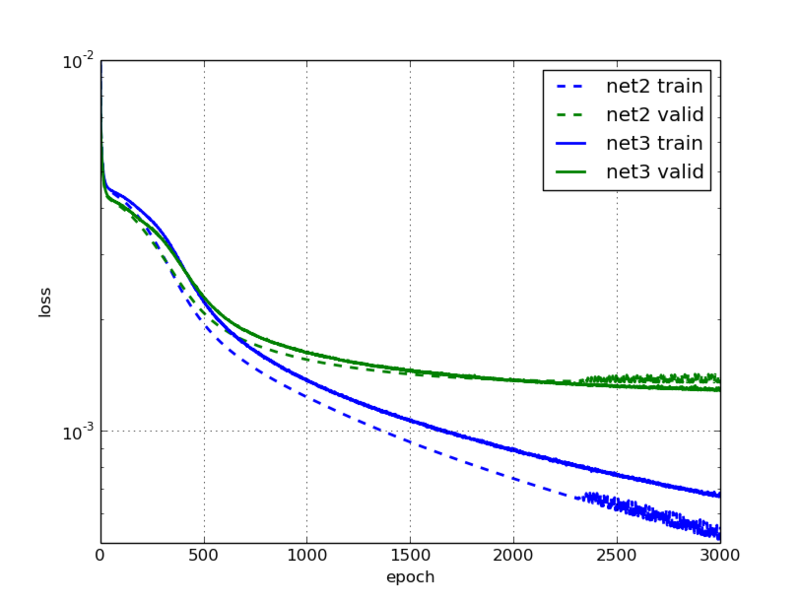 Comparing the learning with that of net2, we notice that the error on the validation set after 3000 epochs is indeed about 5% smaller for the data augmented net. We can see how net2 stops learning anything useful after 2000 or so epochs, and gets pretty noisy, while net3 continues to improve its validation error throughout, though slowly. Still seems like a lot of work for only a small gain? We'll find out if it was worth it in the next secion. What's annoying about our last model is that it took already an hour to train it, and it's not exactly inspiring to have to wait for your experiment's results for so long. In this section, we'll talk about a combination of two tricks to fix that and make the net train much faster again. An intuition behind starting with a higher learning rate and decreasing it during the course of training is this: As we start training, we're far away from the optimum, and we want to take big steps towards it and learn quickly. But the closer we get to the optimum, the lighter we want to step. It's like taking the train home, but when you enter your door you do it by foot, not by train. On the importance of initialization and momentum in deep learning is the title of a talk and a paper by Ilya Sutskever et al. It's there that we learn about another useful trick to boost deep learning: namely increasing the optimization method's momentum parameter during training. Remember that in our previous model, we initialized learning rate and momentum with a static 0.01 and 0.9 respectively. Let's change that such that the learning rate decreases linearly with the number of epochs, while we let the momentum increase. The callback or list of callbacks that we pass will be called with two arguments: nn, which is the NeuralNet instance itself, and train_history, which is the same as nn.train_history_. We'll train two nets: net4 doesn't use our FlipBatchIterator, net5 does. Other than that, they're identical. Cool, training is happening much faster now! The train error at epochs 500 and 1000 is half of what it used to be in net2, before our adjustments to learning rate and momentum. This time, generalization seems to stop improving after 750 or so epochs already; looks like there's no point in training much longer. What about net5 with the data augmentation switched on? And again we have much faster training than with net3, and better results. After 1000 epochs, we're better off than net3 was after 3000 epochs. What's more, the model trained with data augmentation is now about 10% better with regard to validation error than the one without. Introduced in 2012 in the Improving neural networks by preventing co-adaptation of feature detectors paper, dropout is a popular regularization technique that works amazingly well. I won't go into the details of why it works so well, you can read about that elsewhere. 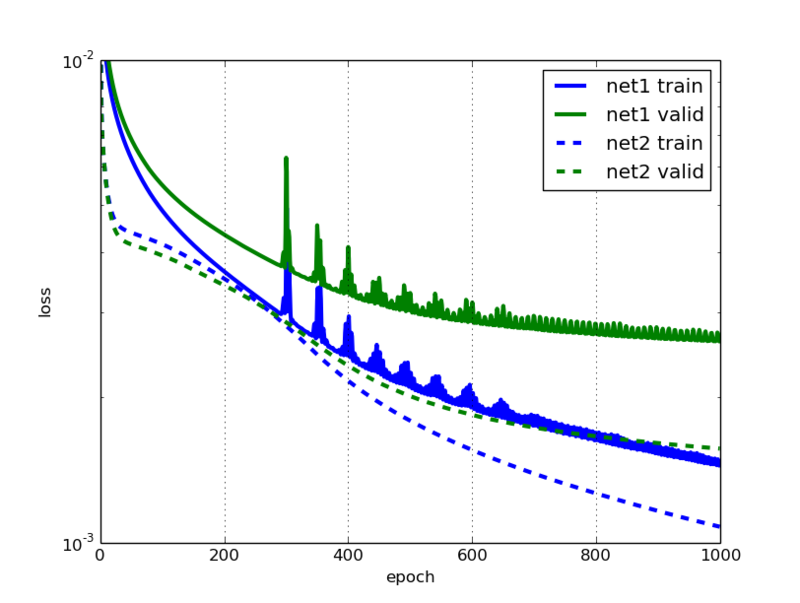 Like with any other regularization technique, dropout only makes sense if we have a network that's overfitting, which is clearly the case for the net5 network that we trained in the previous section. It's important to remember to get your net to train nicely and overfit first, then regularize. To use dropout with Lasagne, we'll add DropoutLayer layers between the existing layers and assign dropout probabilities to each one of them. Here's the complete definition of our new net. I've added a # ! comment at the end of those lines that were added between this and net5. Remember those 70% of training data that we threw away in the beginning? Turns out that's a very bad idea if we want to get a competitive score in the Kaggle leaderboard. There's quite a bit of variance in those 70% of data and in the challenge's test set that our model hasn't seen yet. So instead of training a single model, let's train a few specialists, with each one predicting a different set of target values. 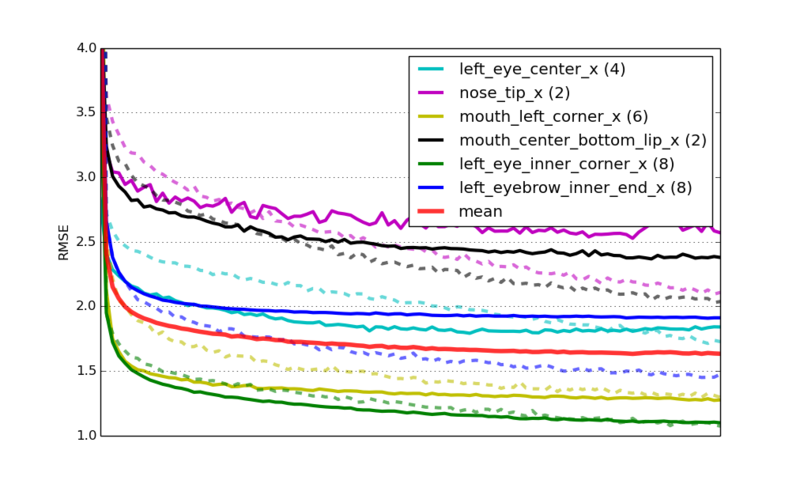 We'll train one model that only predicts left_eye_center and right_eye_center, one only for nose_tip and so on; overall, we'll have six models. This will allow us to use the full training dataset, and hopefully get a more competitive score overall. In the second case, we set the weights of the network back to those best_weights before raising StopIteration, signalling to NeuralNet that we want to stop training. There's nothing too spectacular happening here. Instead of training and persisting a single model, we do it with a list of models that are saved in a dictionary that maps columns to the trained NeuralNet instances. Now despite our early stopping, this will still take forever to train (though by forever I don't mean Google-forever, I mean maybe half a day on a single GPU); I don't recommend that you actually run this. Learning curves for six specialist models. The solid lines represent RMSE on the validation set, the dashed lines errors on the train set. 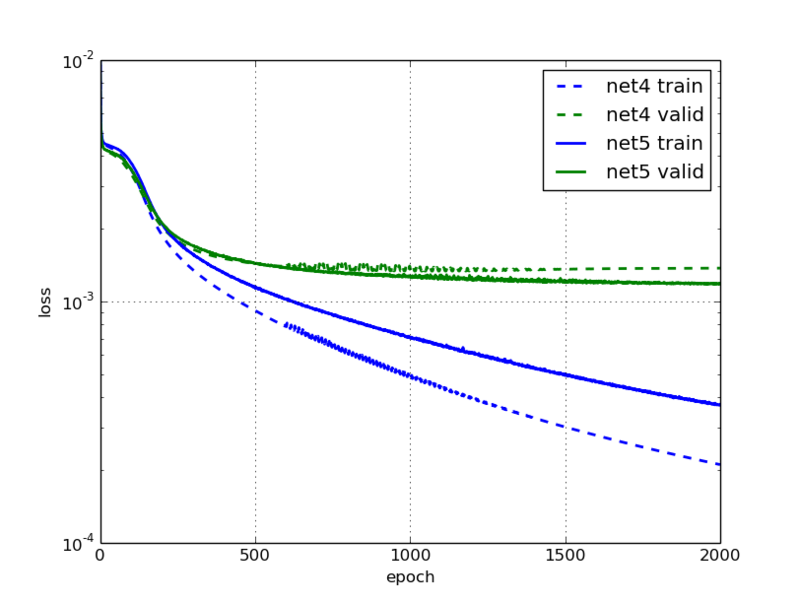 mean is the mean validation error of all nets weighted by number of target values. All curves have been scaled to have the same length on the x axis. Lastly, this solution gives us a Kaggle leaderboard score of 2.17 RMSE, which corresponds to the second place at the time of writing (right behind yours truly). with open(fname_pretrain, 'rb') as f:  # ! net_pretrain = pickle.load(f)  # ! net_pretrain = None  # ! if net_pretrain is not None:  # ! Learning curves for six specialist models that were pre-trained. Finally, the score for this solution on the challenge's leaderboard is 2.13 RMSE. Again the second place, but getting closer! There's probably a dozen ideas that you have that you want to try out. You can find the source code for the final solution here to download and play around with. It also includes the bit that generates a submission file for the Kaggle challenge. Run python kfkd.py to find out how to use the script on the command-line. And there's a ton of other things that you could try to tweak. Maybe you'll try adding another convolutional or fully connected layer? I'm curious to hear about improvements that you're able to come up with in the comments. Edit: Kaggle features this tutorial on their site where they've included instructions on how to use Amazon GPU instances to run the tutorial, which is useful if you don't own a CUDA-capable GPU.